This week, I was in the Harvard Bookstore and I saw this beautiful book on a table with other beautiful books. The cover illustration is by Julie Morstad. Something about how the ocean take up most of the cover, and how the blue feels warm instead of cool, made the book stand out from the rest on the table. Penelope Fitzgerald is an award-winning British author who passed away in 2000. Fun facts, if Wikipedia can be believed: she was the editor at the journal which first published Salinger’s “For Esme, With Love and Squalor” and, as a teacher, her famous students included Anna Wintour and Helena Bonham Carter. I snagged “Offshore” and look forward to reading it on this afternoon’s train ride. Learning about Fitzgerald also has me itching to read her biography, which came out last fall. Glad you have discovered Ms Fitzgerald, one of our (the UKs) national treasures. However, the image on the cover is not suggestive of the ocean (London and the South-East has no access to an ocean as such) but of the River Thames, and the people who live on the river in houseboats, upriver at the Chelsea and Battersea Reaches. And given that this brilliant novel is actually both celebratory and yet disturbing, sometimes troubling, and frequently as murky as the Thames itself, I don’t know if I would describe the deep river water as “blue… warm”! 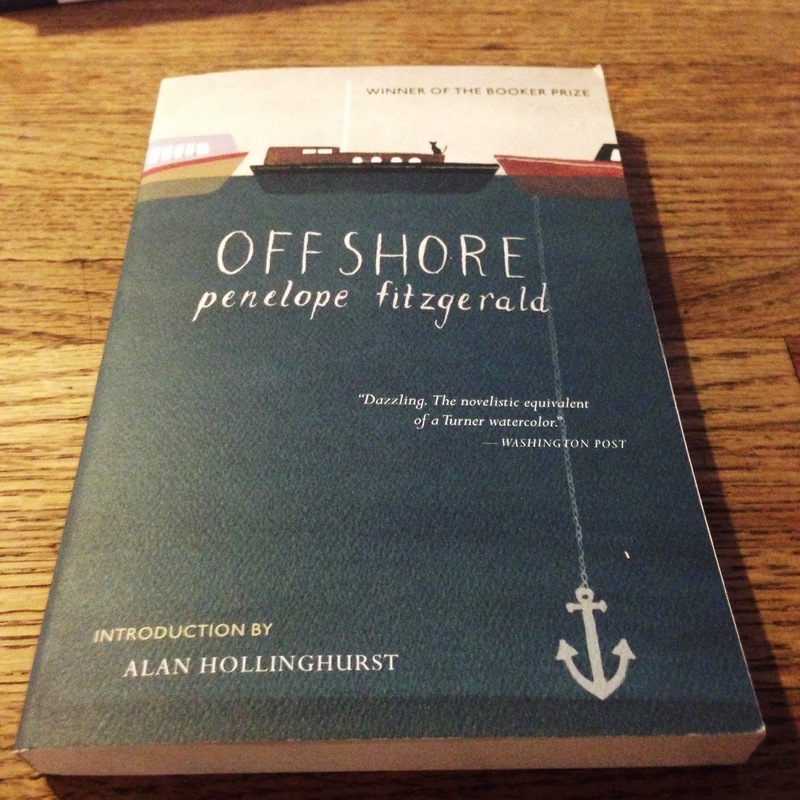 Hope you are enjoying reading Penelope Fitzgerald’s terrific oeuvre; The Bookshop, too, is particularly fine. Her novels continue to haunt the imagination. Thank you for your comment! It must be my New England upbringing that makes me automatically default to “ocean.” I agree with you, after having read the novel, that it is disturbing and unsettling. However, I maintain that the cover illustration suggests the opposite! The cover had me thinking I was in for a more cheerful read. I was surprised but not disappointed, and I look forward to reading The Bookshop. Thanks again for your comment and for the recommendation.